Rio Grande’s Jasmine Smith scores two her career-high 28 points in Tuesday night’s 82-76 triumph over 12th-ranked Indiana University East. Smith also had a game-high 12 rebounds in the victory. RIO GRANDE, Ohio — Midway through the third quarter of Tuesday night’s River States Conference battle at the Newt Oliver Arena, a win for the University of Rio Grande women’s basketball team over 12th-ranked Indiana University East appeared to be a done deal. As things turned out, though, a win over the Red Wolves was anything but easy for head coach David Smalley club. The RedStorm saw a commanding 21-point lead whittled down to two inside the final two minutes, but held on to post an 82-76 victory over their RSC East Division rivals. Rio, who found out just before game time that they received 27 points and were part of a three-way tie for 27th in the latest NAIA Coaches Top 25 poll, improved to 12-1 overall and 3-0 in league play with its 10th straight win. IU East dropped to 8-3 overall and 1-1 inside the RSC. After a back-and-forth affair over the first 17 minutes of the contest, Rio Grande parlayed a 19-2 run which bridged the final 2:52 of the first half and the first 3:14 of the third quarter into a 56-35 lead following a jumper by junior Jasmine Smith (Canal Winchester, OH). The Red Wolves closed the gap to 12 points late in the period and continued to methodically chip away at the deficit, pulling as close as 71-69 after the second of consecutive buckets by All-America candidate Tia King with 1:34 remaining in the contest. 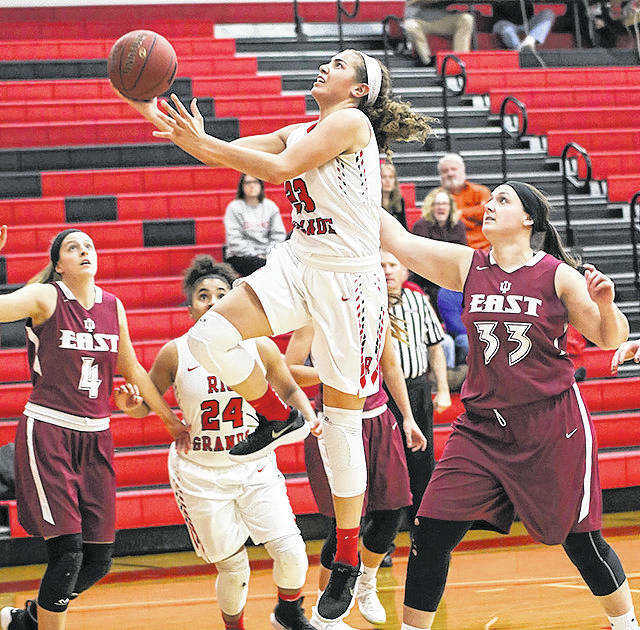 The RedStorm answered, though, getting a three-pointer by sophomore Sydney Holden (Wheelersburg, OH) on its ensuing possession and a layup by junior Jaida Carter (New Philadelphia, OH) 26 seconds later to push the lead back to seven, 76-69, with 50 seconds left to play. IU East got no closer than five points the rest of the way. While Holden and Carter hit the shots which, essentially, ended the Red Wolves’ comeback hopes for good, it was Smith who fueled the fire of Rio’s winning effort throughout the night. Smith finished with a career-high 28 points — 16 in the first half and 12 after the break — to go along with a game-high 12 rebounds. She hit her first eight field goal attempts in the game and finished 10-for-13 from the field. Holden had a strong performance in her own right, tallying 16 points, eight rebounds and five assists. Sophomore Abby Wendel (Portland, IN) also reached double figures for the RedStorm, netting 12 points to compliment a game- and career-high six assists. Rio Grande survived 23 turnovers and a cool shooting touch in the second half (11-for-27, 40.7%) by shooting just under 56 percent in the first half (19-for-34) and holding a 41-29 edge in rebounding. King, who was recently featured in the “Faces in the Crowd” portion of Sports Illustrated’s Dec. 4 edition for her exploits over the past four seasons, had a game-high 30 points — 21 of which came in the second half — in a losing cause for IU East. She also had six rebounds to go along with a team-high four assists. Kristen Miller added 16 points and a team-high three steals for the Red Wolves, while Mackenzie Campbell had three steals of her own in addition to 14 points and a team-high eight rebounds. Rio Grande returns to action Friday afternoon at Ohio Christian University. Tipoff is set for 3 p.m.